If you're flying from New York to Hong Kong the last thing you need to be doing is trying to recharge your watch!! With poor battery life, smart watches are anything but smart! Until today! Time to unplug. The Eco-Drive Proximity Pryzm requires zero wires or plugs for charging. Powered by light, the Eco-Drive Proximity, is a smarter watch for the tech-savvy consumer with Bluetooth compatibility to iOS and Android. The Proximity Pryzm has every feature a pilot could want including a perpetual calendar, 12/24-hour time, dual time, alarm, power reserve, light level indicator, time and date sync. Additional capabilities include phone search/filter, visual/vibration alerts and more! 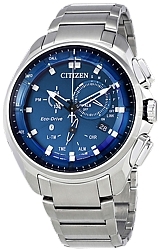 This model appears in stainless steel with azure blue dial and a uniquely cut sapphire crystal.